Yes, it is possible for cinema to be too “indie.” We don’t just mean mumblecore, but that is a good example. To be fair, Tetsuo’s only completed ultra-indie film is probably more watchable than that twee naval-gazing sub-genre, but the entitled filmmaker’s exploitative behavior gives micro-budget a bad name. He is definitely cruising for a karma bruising in Eiji Uchida’s Lowlife Love (trailer here), which screens during this year’s Japan Cuts: Festival of New Japanese Film in New York. Tetsuo still lives at home, contributing nothing to his family household, but he drives his mother crazy with all the would be actresses he drags home. Based on his minor festival hit, Tetsuo charges exuberant fees for “acting lessons,” promising to put his so-called “troupe members” in his next film. However, the only thing he really shoots are amateur dirty movies that his loyal minion Shinjo sells to the Yakuza. Much to his surprise, Tetsuo starts getting ambitious again when Minami and Ken join the troupe. She is shy, but she can really act, whereas he has written a screenplay so promising, even Tetsuo couldn’t ruin it. When the sleazy wheeling and dealing producer Kida actually starts to line-up financing, Tetsuo starts to believe. However, many of the actresses that granted him sexual favors now expect to be the lead, especially the brassy and brassed-off Kyoko. Unfortunately, the dream starts to fade when sell-out director Kano aims to steal his script and his leading lady. You will be hard-pressed to find a film with a more odious protag than Lowlife’s Tetsuo. Frankly, it is just flat-out unpleasant to spend time with him during the first two acts. Yet, that is also why it is pretty impressive when the film starts to come together and pay-off down the stretch. Uchida will spare his Tarantino-esque man-child little and never let him off the hook. Rather bizarrely, the Christian church Tetsuo tries to scam might be the only institution to make it through Lowlife unscathed, but that’s cool. As for the movie business, it is barely distinguishable from the Yakuza. As Tetsuo, Kiyohiko Shibukawa makes the audience absolutely hate him. You have to respect his work when it inspires such a visceral gut response. Maya Okano is disturbingly devastating as Minami, the innocent who sells her soul. The crafty veteran Denden looks like he is having a blast playing Kida and it is even more fun to watch him upstaging everyone. Chika Uchida’s Kyoko adds a further espresso shot of attitude as Kyoko, but poor Shugo Oshinari and Kanji Tsuda can hardly keep up as the relatively grounded Ken and Shinjo, respectively. Lowlife is a dark film that keeps getting darker. Yet, like the best provocative films, there is a point to despicable acting out it depicts. Nobody would want to resemble Tetsuo, not even remotely. 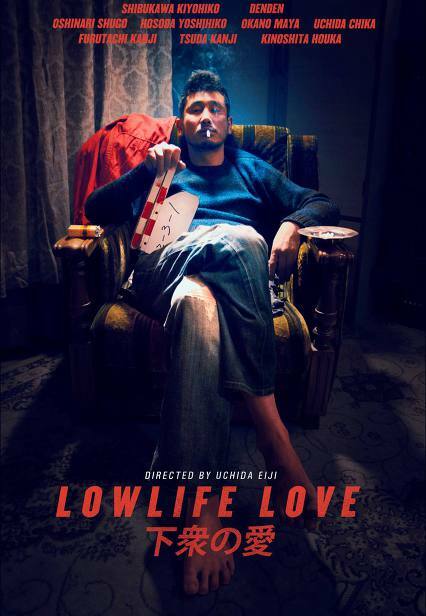 Recommended for hardy fans of Japanese Cinema who take their coffee black and their morality tales even blacker, Lowlife Love screens this Friday (7/15) at the Japan Society, as part of Japan Cuts 2016. Lucha Mexico: Who Are Those Masked Men? Tabloid Vivant: Yes, but is it Art?